Kris Krendo is a member of the most prestigious magic society in the world the Magic Circle, and has been a professional magician for over 25 years. You can be assured of only getting the very best in magical entertainment when you hire him for that special event or occasion. Kris creates a fun atmosphere with his friendly demeanour and interacts with the audience, while creating WOW factor magic. Kris Krendo is one of the most sought after Magicians in the country travelling many thousands of miles each year to London, Cardiff, Birmingham, Manchester and Edinburgh to name just a few places. He as also performed at the world's greatest variety theatre The London Palladium. The Magic is ideal for Birthday Parties, Weddings, Anniversaries, Gala Dinners, Conferences, Sales Meetings, Product Launches, Trade Shows or any other event where people want high quality magical entertainment. "Thank you so much for your appearance at the Lowry Hotel in Manchester for the Everton player's. The gales of laughter coming from each table shortly after your arrival indicated to everyone that you had instantly broken the ice and created a terrific atmosphere in the hotel room, Thank you so much for joining us and look forward to booking you again." "Everybody is still talking about the magician at our wedding. I have seen lots of magic shows but can say I have never seen anything like that shown as close up magic! Everyone was very impressed!" "We wanted to say a huge thank you for your magic at our wedding. It really added something special, it was like something you see in the movies or OK magazine." Book Paul with full confidence. Pat Dunachie is a young magician based in the midlands who performs close-up, mental and stage magic. He has performed for large groups of people, small gatherings and all different types of occasion. Though he is only 14, he performs in an astonishing and mature way. He belongs to the Young Magicians Club, which is a "youth initiative" of the Magic Circle. He can perform as a double-act with his friend and colleague George and also as a solo act perfect for restaurants, shows, dinners and the like. 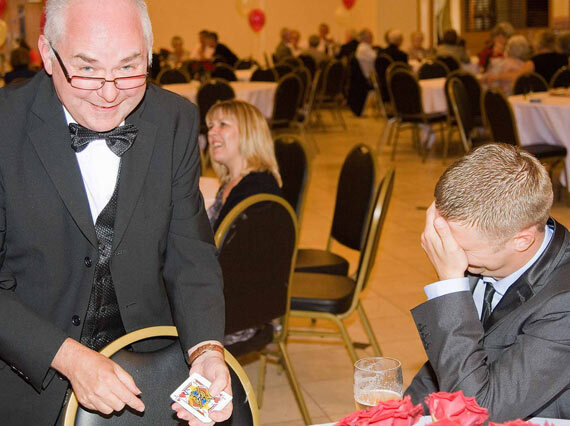 Shropshire based Children's Entertainer and Magician, Magic Kev really knows how to put on a sensational magic show for your child's birthday party, social event or function. Magic Kev will make items disappear and reappear in unopened and factory sealed tins of baked beans, make lights appear from behind children's ears and make the water from cups vanish (much to the delight of the brave child standing beneath the aforementioned cup). All of the above plus some music from a guitar or banjo for musical games, and the now infamous smelly sock race will be performed. All parties conclude with balloons for all the children shaped into animals, hats, flowers, swords etc, (time permitting). Magic Kev will give out Magician's Assistant Certificates to all of his helpers including the Birthday Child, plus the prizes for the games within the show. Magic Kev's priorities at a children's party or Magic Show are for the children and everyone to have a good time, laugh a lot, get involved, let the kids help to create the Magic, giggle at Magic Kev when he (pretends) to hurt himself on a stretched balloon and for the kids to remember that they had a fantastic time at your Party or Event. More facts about Magic Kev. Magic Kev also draws from his vast experience and professional training he gained from working within the UK care industry. Working with young people for various charities and care organisations including MENCAP and N.C.H’s, learning how to interact and communicate with children who have special needs, autism or challenging behaviour have given Magic Kev fantastic knowledge and insight at connecting positively with children. He has been working professionally with children for 12 years in music workshops, the care industry, balloon modelling workshops and of course magic Shows. Member of the Shropshire Magic Society. Find his adverts in the yellow pages, and the Shropshire Grapevine Magazine. Magic Kev has a Degree in Philosophy and History. Magic Kev has performed at many of the UK festivals including Glastonbury and Edinburgh. Magic Kev's Magic Shows for birthdays are typically aimed at the 4,5,6,7 year olds. For older children Magic Kev is available for a one off magic lesson as a gift for your child. For groups of younger children, say a group of mostly 3 and 4 years olds (like preschool, nurseries and kindergardens), Magic Kev will alter the show slightly to include more games and music with a little less "complicated" magic. Rob blends close up magic, mentalism and the storytellers ability to weave wonder to create a unique experience. He has performed in the UK and Europe, form Edinburgh Castle to Amsterdam. Be it Corporate, Weddings, Parties young or old magic will leave everyone feeling part of something special. Rob's warm approach and experience leave audiences with a night to remember.